In my earlier submission, I predicted that the budget battle between the Mayor and the Public Defender’s office would end badly. What I didn’t predict is what actually happened. Here’s the quick summary: Jeff Adachi has been battling the Mayor’s office for months, arguing that cutting his staff would cost the city more than it would save. Although Adachi undertook a grassroots campaign — including a justice summit, a City Hall rally and a grassroots campaign to mail in thousands of postcards — Newsom nonetheless chopped $1.9 million from Adachi’s $23 million dollar budget. When a City Controller’s report was issued supporting Adachi’s arguments, and the usually conservative Chronicle issued a strong endorsement of Adachi’s position, the Board of Supervisors’ budget committee responded by voting 4-1 to redirect $600,000 from the Superior Court’s budget to help cover the Newsom’s cut to the Public Defender’s budget. Here’s the kicker: After a closed door meeting with the Mayor’s folks, Board President David Chiu and Budget Committee Chair John Avalos agreed to transfer $300,000 from Adachi’s budget and award it to the District Attorney. That’s the equivalent of fleecing someone and giving it to his or her adversary. Chiu and Avalos’ move was not revealed until the list of budget items restored to the city’s budget —known as “addbacks” — were released at around 6:00pm last Wednesday. According to the web blog SF Appeal’s coverage of the night, Adachi was not happy with the outcome. 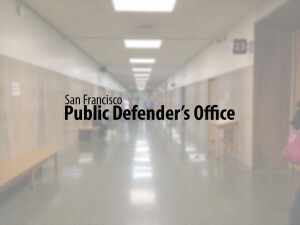 After each of the Supervisors on the budget committee gave their “this is a great budget” speech, vice-chair Ross Mirkarimi moved to amend the budget to add an additional $450,000 to the Public Defender’s office, noting that the add backs failed to address the shortfall in the office’s budget. Although Supervisors Campos and Dufty voiced their support of the amendment, Avalos balked, saying that he didn’t feel comfortable with the decision and wanted to think about it. President David Chiu, who isn’t on the committee but was seated at the hearing, chimed in and said that any money given to the Public Defender had to be split with the District Attorney. Chiu’s statement was curious, given the fact that the offices have very different budgets (the DA’s budget is almost twice that of the Public Defender’s budget) and very different functions (the DA charges crimes while the Public Defender’s office has clients who they are required to defend). Avalos’ refusal to support Mirkarimi’s amendment effectively froze the effort to add funds to Adachi’s budget. However, because Supervisor Dufty felt that Avalos should have time to consider the amendment, the decision was put over until July 14, when the full board will vote on the city’s budget. That David Chiu, who is a former SF Deputy District Attorney and a political climber, used this opportunity to gain favor with climber Kamala Harris is not surprising. Chiu probably figured that by transferring $300,000 into Harris’ budget, he would earn a few political chits with Harris, who has her sights on the state’s Attorney General’s office. But it’s rather odd that Avalos, who was a social worker and union organizer before serving as Chris Daly’s chief aide, would deliver Adachi such a humiliating blow. According to Avalos’ campaign site, Adachi was one of the few elected officials and department heads to endorse Avalos’ bid for office (a decision I’m sure Adachi now regrets). City hall insiders say that Avalos, as the chair of the Budget Committee, had a $75 million list of programs and services he wanted to have added back, but only $22 million available to spend from the committee’s review of department budgets. When Chiu and Avalos met with the Mayor’s folks behind closed doors, the Mayor magically came up with another $25 plus million for Avalos to spend. But there was a price to pay for the money: save the Mayor’s pet programs, such as the Community Justice Center, and help us screw Jeff Adachi. Avalos had staunchly opposed the Community Justice Center as a waste of public resources and recommended defunding it. He had also voted, along with three other committee members, to restore $600,000 to the Public Defender’s budget. Why the about face? It all comes down to money, honey. So Adachi’s budget loss was just a by-product of a mayoral deal Avalos and Chiu couldn’t refuse. What remains now is that Adachi will have to do what he had hoped to avoid: lay-off public defenders and begin to outsource cases to private attorneys. He will finally have the chance to prove that firing public defenders will cost taxpayers $1 million more a year than what it would save by cutting his staff. But perhaps the moral of this twisted story is that San Francisco corruption isn‘t in the graft or the exchange of envelopes which ensnared former Supervisor Ed Jew. It’s in the way that political business is done in this town by officials such as Newsom, Chiu and Avalos who make decisions based on political expediency, not on what is right. It will be interesting to see what the Board of Supervisors’ does on July 14th when the matter of restoring the Public Defender’s budget will be considered again. This time, Adachi will need six, not three votes, and he may not be able to count on Avalos or Chiu to get there.